USC AEC toured the SpaceX facilities located in Hawthorne. SpaceX is a private company that designs, manufacturers and launches advanced rockets and spacecraft. As seen in recent news, SpaceX is working toward developing reusable rockets which will revolutionize the space industry. Networking before and after the tours was held at Eureka! The USC Construction Alumni Group would like to thank everyone who attended the Metropolis Job Walk on Wednesday August 24, 2016. We hope you enjoyed learning about this this 6+ acre complex consisting of multiple state-of-the-art, mixed-use buildings as much as we did. We also would like to thank Webcor Builders for making the Metropolis site available to our alumni and to industry professionals and for giving us a tour of the site! For those who could not make the Metropolis Job Walk event, stay tuned for future USC Construction Alumni events! 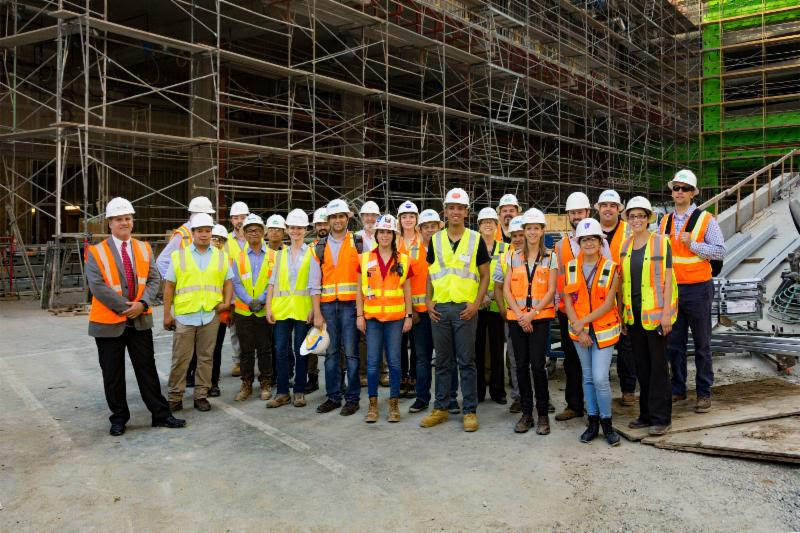 Thank you to all who visited the USC Michelson Center for Convergent Bioscience project site presentation and job walk led by the DPR Construction. As one of the largest buildings on campus, it will be the home to some of USC’s cutting edge research. Following the site visit, the group networked on campus at Traditions Bar & Grill.